As you add a new contact to your job worksheet, you have the option of choosing what job role to assign to them as they relate to that particular job. Note that job roles do not permanently “attach” to the individual’s address book entry, as one contact may have different roles across multiple jobs if they are a repeat client. Depending on your areas of photography coverage, you may find that the job roles that came pre-filled with your Táve account are all you need, or you may choose to add custom job roles to fit your unique practice. You can get very creative with job roles to help you manage all of your contacts! 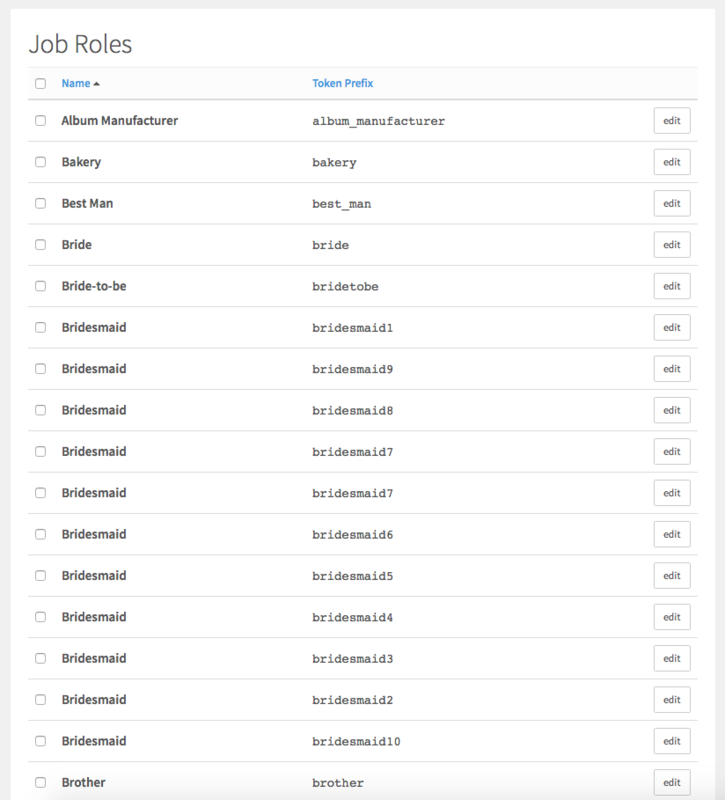 As you can see from just the start of my list of job roles below, I’ve created many custom roles, such as various bridesmaids (see how these can be helpful in the “Populating Job Contracts Using Job Role Tokens” section below), bride-to-be (for engagement sessions) and brother (for family sessions), among others. If you’re a wedding photographer, some essential job roles can include the bridal party, bride and groom family members and all of the vendors involved in the big day. Some useful job roles for a newborn photographer may include a mother, father and newborn. Do you often sell gift certificates for your photography services? Add gift certificate purchaser and gift certificate recipient job roles to help you better track who the individuals are on that order. As stated above, you can add new job roles and even delete some of the default ones Táve provides if they’re of no use to you. When adding a new job role, you’ll just need to choose the correct “kind”. Your 4 choices for job role kind include team, subject, customer or vendor. You will choose team when this type of person or company is a member of your photography studio’s team working on your jobs. If the individual is the type who will be photographed, like clients and others in front of your camera (i.e. bridal party members), you’ll choose the subject kind for the role. Customer is a more rare job role type for individuals who may commonly make purchases from your studio but have no other connection to a job. If they are a wedding or print vendor you’d choose the vendor kind when creating custom vendor job roles. More about vendors can be found below. Much like individual contacts, vendors can be stored and tracked in your Táve address book, where you can populate all of their relevant contact information, track your email interaction with the vendor and see which jobs you’ve worked with the vendor on. As you can see in the screenshot below, your vendor’s Vendor Role can be chosen directly from the company or individual’s contact card in the Vendor Role dropdown. On a job’s worksheet (click “edit job worksheet” in top right of the job overview page) you can view all of the job’s contacts, including your clients, subjects and vendors involved in the session or event. As you add a new contact to a job worksheet, you’ll want to select their appropriate job role from the dropdown. You’ll also notice just below the contact you are adding that, as you start to type in a contact’s name, Táve will predict who you may be adding if there are contacts with similar names already in your address book. This is a great shortcut when working with repeat clients or vendors on a new job, as it saves you the time of adding their information again, and it will now link this new job to their contact card in your address book. Táve will automatically generate Tokens for things like the name, address, phone number, etc. for all of your job roles. For each of the job roles that exist in your settings, you should see their related tokens in your available Tokens lists throughout Táve as you customize your Email Templates, Contracts and more. 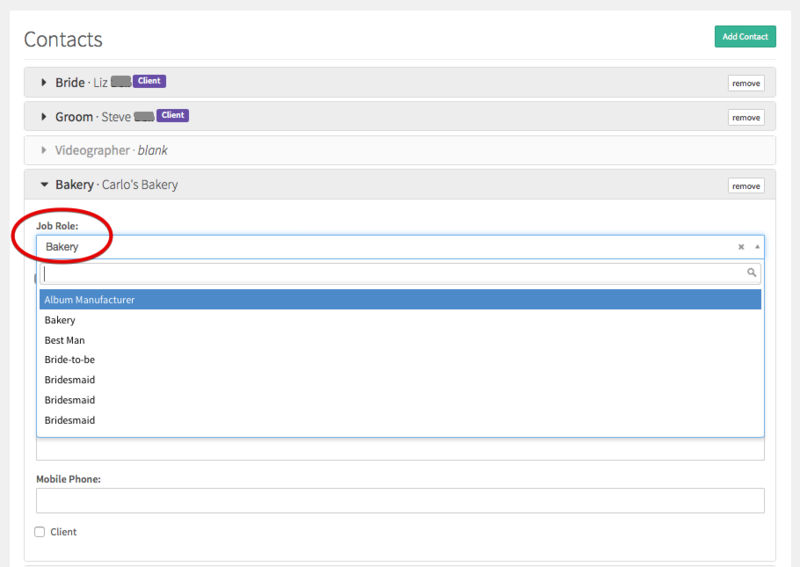 You can even use these job role tokens to populate a contact’s information on your job using a Questionnaire. If you have created a field in a questionnaire that you’d like to link to a field on its related job worksheet or contact card, you can click on the sideways arrow, as shown below, to edit the field and link it using the appropriate token. 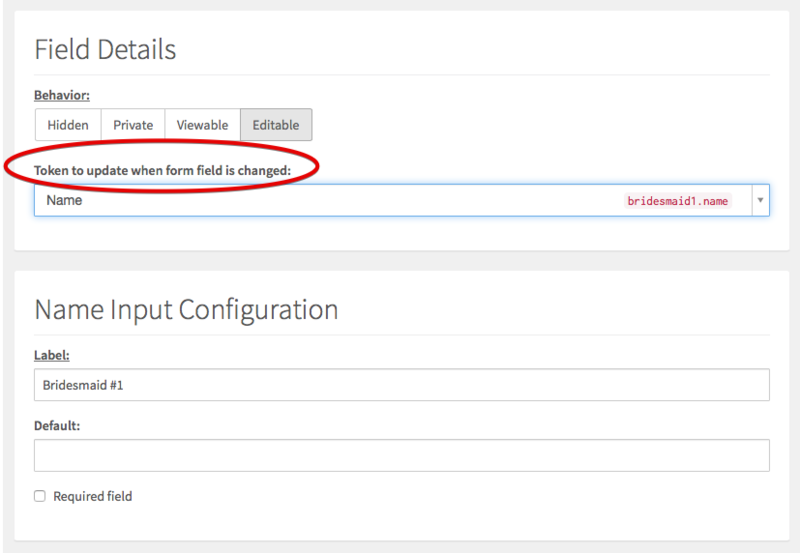 Once inside the Field Details, you’ll see the option to select a token to update if data is entered into this field by a questionnaire recipient. 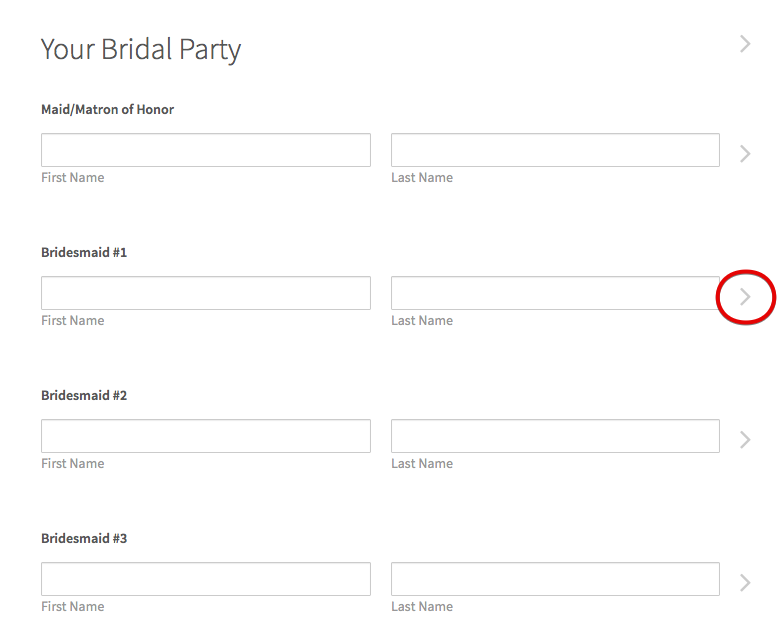 In this example, since I am asking for Bridesmaid #1’s full name, I have selected to have this field automatically update the contact card for Bridesmaid #1 on this job once my bride and groom have filled in her name. As with many of the questionnaire fields, you can choose at the bottom of the editor whether or not you want to make this field required before submission. Do you like to keep track of referrals so you can thank whoever sent business your way? Or maybe you have a referral rewards system in place to issue credit to the referring party? One great way to track your referrals is by having a Referral job role and add the person to the job’s contact list as such if they deserve the credit. 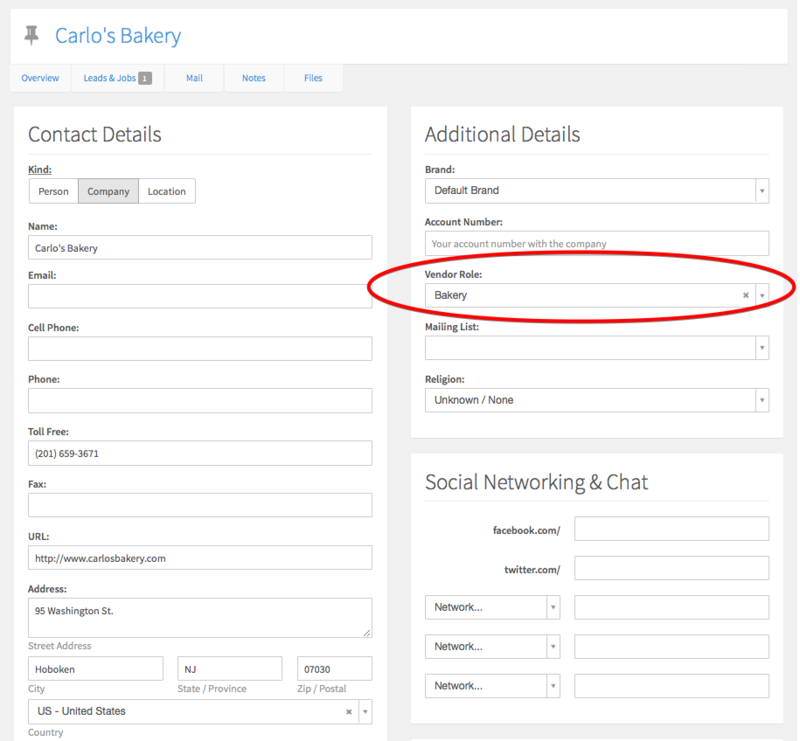 Then, when you go to their contact card in your address book you’ll be able to see all the jobs they’ve referred to you!